Here you will find all the information or documents which may be useful to you (current projects, booking instructions, maps …). For the most part, these documents are downloadable. The reservation must be made by the person (an adult) occupying the pitch/place. Minors must be accompanied throughout the stay by their parents. 1 pitch = 1 family = 1 payment. Directly on our website camping-cap.com via our reservation module (thélis résa), we do not take reservations by mail, email or phone.. Select your holiday dates, the number of participants and the type of accommodation you require : pitch or bungalow/lodge. Make sure you choose the correct category of pitch depending on your equipment. Concerning your vehicle, please be sure to correctly fill in this section as some pitches are inaccessible to campervans or modified sleeping vans, it is important that we know whether or not you will be sleeping in the vehicle or not for the same reasons. No pitch changes are possible after payment. Warning, do not select a tent pitch if you have a campervan or caravan, or vice versa otherwise your reservation will not be validated. If you are a returning customer you can note down your client reference (barrier code) and your preffered pitch. However, this is simply a preference and can in no way be guaranteed. You will immediately be informed of the cost of your stay depending on the details given. An automatic confirmation email will be sent to you indicating that we have received your request. It will either be accepted or refused by the campsite and you will be informed by mail. (Processing takes longer in January and February). You will need to click on the link (or send us a cheque from a French bank account) to pay the corresponding deposit. We would like to draw your attention to the fact that payment of the deposit is understood to be acceptance of both the dates and place and no further changes are possible. We will send you a confirmation letter which you will need to present on arrival at the campsite. As a reminder, pitches are allocated by order of arrival and depending on your equipment, our planning and the number of people. Be sure to correctly fill in all fields. We would like to draw your attention to the fact that these changes mean longer processing times due to a large number of requests. We thank you in advance for your patience. Special requests, side by side pitches etc…. or because there are no longer places available. 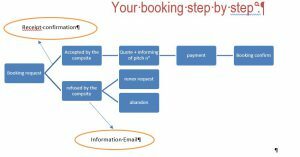 It is imposible to cancel your reservation request (see cancellation cases allowed for in the terms and conditions. In this case, you may wish to come without a reservation as we keep back 127 pitches, however we must warn you that the period from 14/07 to 25/08 is extremely busy. See diagram on following page.